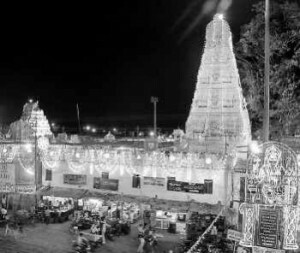 Located 38 km from Karimnagar, at Vemulawada is the famous temple dedicated to Lord Rajarajeshwara swamy, which draws pilgrims from far. Built by Chaluka Kings between the 750 AD & 973 AD, the complex houses several temples dedicated to deities like Sri Rama, Lakshmana, Goddess Lakshmi, Ganapathy and Lord Padmanabha Swamy. Another interesting temple is dedicated to Lord Bhimeshwara.There are a number of open galleries in the complex that are worth seeing; especially the Mirror gallery and a corridor with a number of Shiva idols. The tank at the temple, called Dharma Kundam, by itself is a place of tourist interest since its believed that the water has curative properties. Pilgrims first bathe in this tank and then proceed for Darshan. Interestingly there is a Muslim Dargah inside the temple complex where all devotees irrespective of caste or creed offer prayers. The temple authorities have provided 400 rooms for the convenience of tourists. This entry was posted in Andhra Pradesh, Vemulawada. Bookmark the permalink.